2/27/19 - Currently we are in the process of relocating due to excess flooding. We will keep everyone up to date on social media as to our whereabouts. We hope to be reopen in the San Bernardino Mountains by the end of March 2019. Thank you endlessly for your continued support during this unforeseen transition. Shannon Young, Mike Tuten and Sara Ray. Hours: Thurs-Mon 12-6pm. We are closed Tuesdays and Wednesdays. Please stop by or email us to schedule a consultation to discuss your custom tattoo ideas. 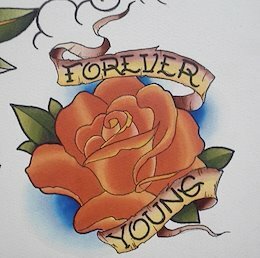 We require at least a $50 non-refundable deposit to secure your tattoo appointment and create a custom drawing for you. The deposit will be applied towards the total price of the tattoo. Our shop minimum is $60. If you are getting a tattoo that requires more than one sitting, your deposit will be taken off of your very last sitting. Deposits are only honored for three months without beginning the execution of a tattoo. If you are not prepared to begin the process of getting tattooed, do not leave us a deposit and expect that it is good indefinitely. While we prefer cash, you can also pay with Paypal. We require no less than 24 hours notice to reschedule an appointment. If you cancel within 24 hours of your appointment, you forfeit your deposit. We would love to make your tattoo dreams a reality! Thanks for checking us out! Shannon Young’s Derby Decks are now for sale online!!! If you are interested in the purchase of multiple decks, or any of the other products we offered during our sucessful Kickstarter – prints, postcards, and uncut sheets – please contact: sandboxmodellc@gmail.com. We take oil, acrylic, watercolor paintings, drawing, embroidery, mural, jewelry, sculpture and many other artistic commissions. Email us with your custom art ideas.